Askrigg is located in Wensleydale. Wensleydale is a beautiful valley set in the northern dales of the north Yorkshire Dales National Park. It is an ideal bed and breakfast holiday location and provides a wonderful base from which to explore the area’s varied places to visit. There are numerous historic and landscape features to enjoy in the Askrigg region of Wensleydale and the north Yorkshire Dales National Park. For more iformation or for books on Askrigg and Wensleydale, visit the Discovery Guides Online Bookstore. Not far from Askrigg in this green, rural dale are a multitude of dramatic and exceptional waterfalls. At Hardraw, near the market town of Hawes, can be found, Hardraw Force, England’s highest single-drop waterfall, whilst further downstream at Aysgarth are the three magnificent sets of waterfalls on the River Ure known as Aysgarth Falls. History too abounds here with a fine collection of castles, abbeys and museums. Of particular note are the impressive Bolton Castle that is visible from many parts of the dale, the famous Middleham Castle, the magnificent ruins of Fountains and Jervaulx Abbeys, Ripon Cathedral, plus the Dales Countryside Museum. Also of note are the Wensleydale Creamery Visitor Centre, the Wensleydale Railway and Forbidden Corner. 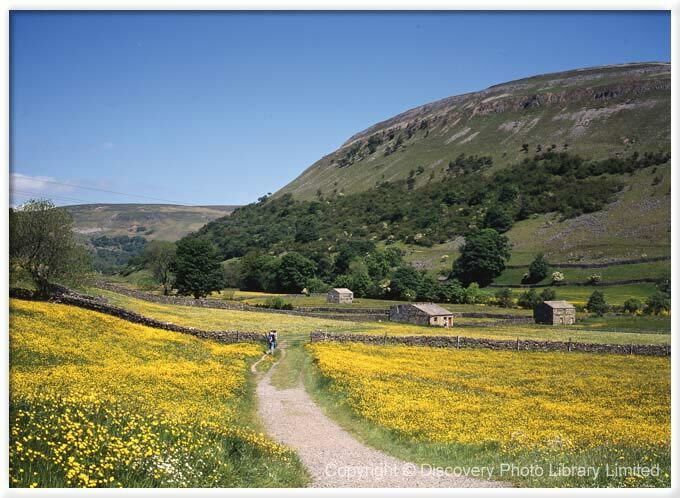 To the north of Wensleydale can be found the smaller dales of Teesdale, Swaledale and Arkengarthdale, to the west is the ‘hidden kingdom’ of Dentdale, whilst to the south can be found the delights of such as Nidderdale and Wharfedale. Throughout Wensleydale and its surrounds can be found numerous quaint, stone-built villages, such as Askrigg which can lay claim to be the heart of Herriot Country. These villages contain some lovely country inns and restaurants, such as the lovely, family-run White Rose Hotel at Askrigg. All in all, both Askrigg and Wensleydale provide a beautiful holiday location in the north Yorkshire Dales National Park, endowed with unspoilt countryside, peace and quiet and lots of fresh country air. The White Rose Hotel is a perfect starting point for your break in the heart of the Yorkshire Dales. From Askrigg you can travel either up or down Wensleydale, both directions offering a wide variation of sights and attractions. Head up the Dale and you will soon reach the small market town of Hawes, a tourist hot spot. Hawes is famously known for its biggest export, Wensleydale Cheese! The Wensleydale Creamery has a visitors centre and restaurant. Guided tours are available to watch the cheese being made! Also in Hawes are The Ropemakers. The Ropemakers attracts thousands of visitors every year, who come to watch traditional rope making in progress. Again, they have a fascinating visitors centre and shop. Moving back down the Dale you will find many small villages, each with their own amazing history. Castle Bolton is one of these. The castle at Castle Bolton was once where Mary Queen of Scott was held. The castle is open for visitors all year round. Climb the castle tower to get some amazing views of the Dale. Castle Bolton is highly recommended for children, it's sure to spark their imagination! As you come further down Wensleydale you reach Leyburn, another market town, with many small shops and attractions. A tourist information centre is situated in Leyburn. Although a little further out, The Forbidden Corner is a must if you have children. The Forbidden Corner is a unique labyrinth of tunnels, chambers, follies and surprises created in a four acre garden in the heart of the Yorkshire Dales. Recently it has been voted the best childrens' attraction in Yorkshire.